Looking for some fun ways to teach patterns? Today I’m sharing a big variety! Basic math skills in preschool and kindergarten set the foundation for learning more advanced math concepts later on. Patterning is one of those important early skills. Thankfully, patterns are easy and fun to teach! 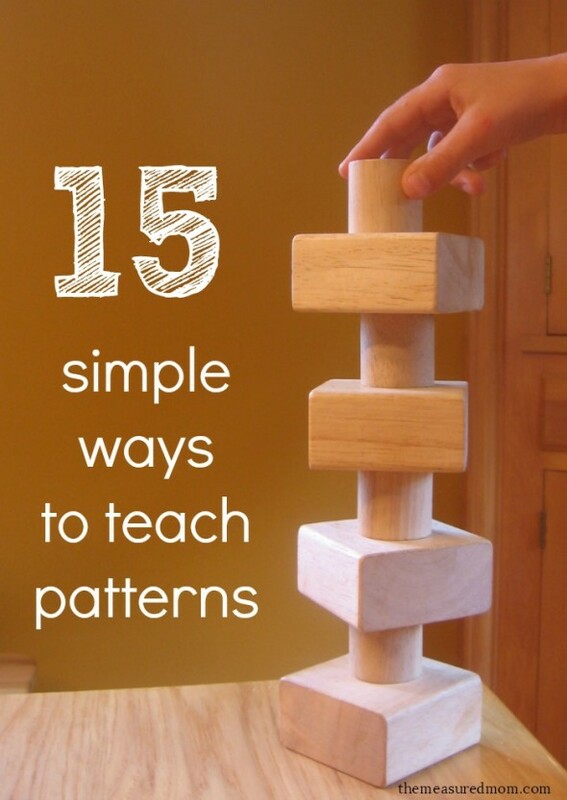 Read on for 15 simple ways to teach your early learner about patterns. 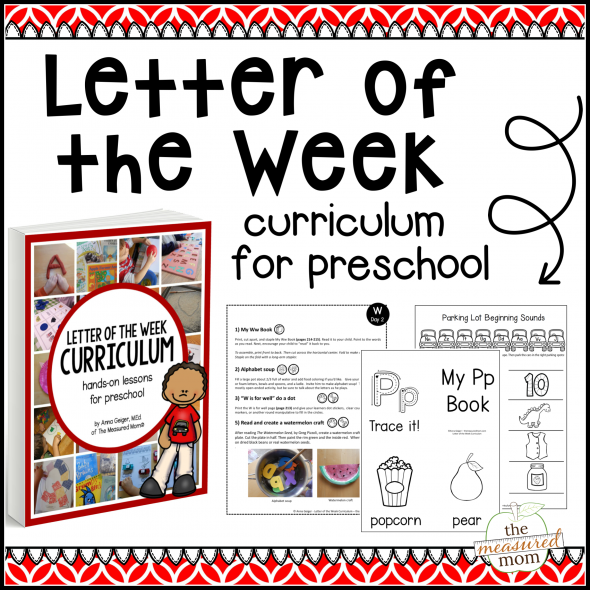 At the end of the post you’ll find a variety of free printables as well! 2. Make a pattern with toys. We love to make patterns with Duplos. 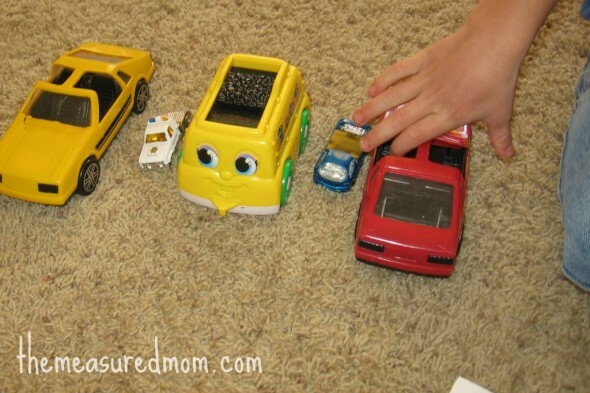 Making patterns with toy vehicles is fun too. 4. Make a sound pattern with rhythm instruments. BANG, tap, tap, BANG, tap, tap. Start out by making a pattern and having your child copy you. 5. Get out a colored manipulative and make patterns. We like to use color tiles, counting bears, and pattern blocks. You could also put pom poms in an ice cube tray. 6. Make patterns with stickers. 7. Save lids and make a variety of patterns. 8. 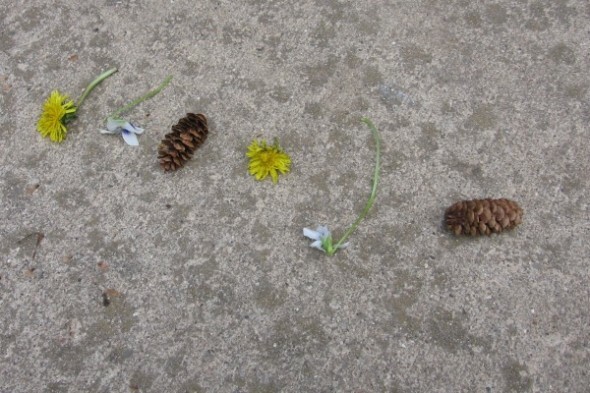 Create patterns with objects you find in nature. 9. You can make a pattern with everyday household objects. Fork, knife, spoon, fork, knife spoon. Big book, small book, big book, small book. 10. Have your child make her own patterns using stamps and washable ink pads. 11. Draw simple patterns using crayons. 12. Make patterns by sliding balls of play dough onto skewers. 13. Use coins to make patterns. 14. Notice patterns you see everyday. Have your child find the tile in your bathroom floor, the pattern in your backyard gate, or the pattern in the picture frame on his wall. Pretty soon he’ll be finding patterns to show you! 15. Here’s a fun one – make patterns using snack food. Pretzel, cracker, raisin, raisin. Pretzel, cracker, raisin, raisin. 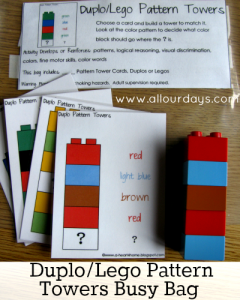 Get these printable Duplo pattern towers from All Our Days. 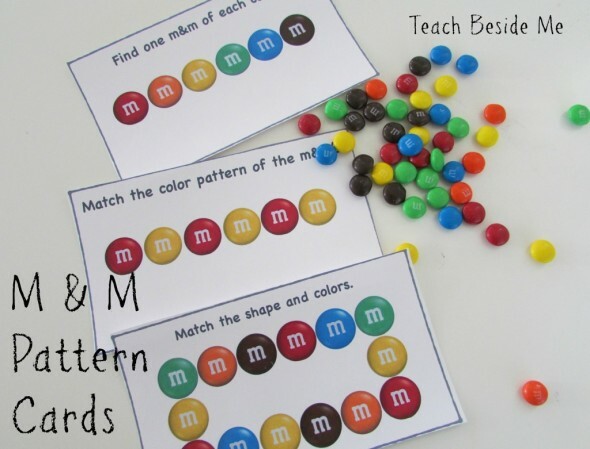 Get free M & M pattern cards from Teach Beside Me. 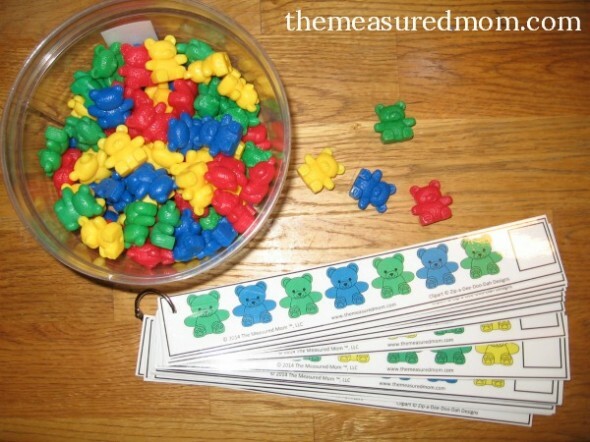 I’ve shared counting bear pattern strips. 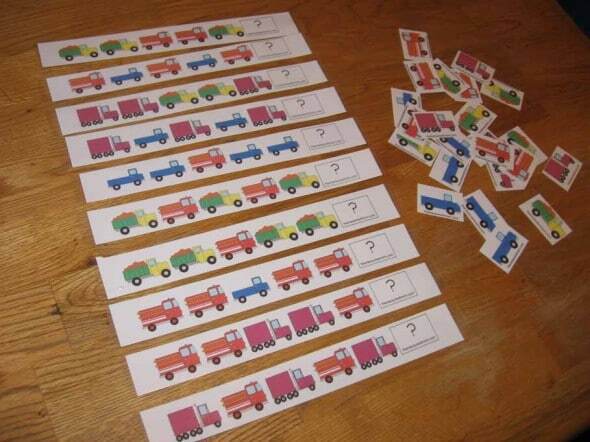 My truck pattern strips are one of the first printables I shared at The Measured Mom. 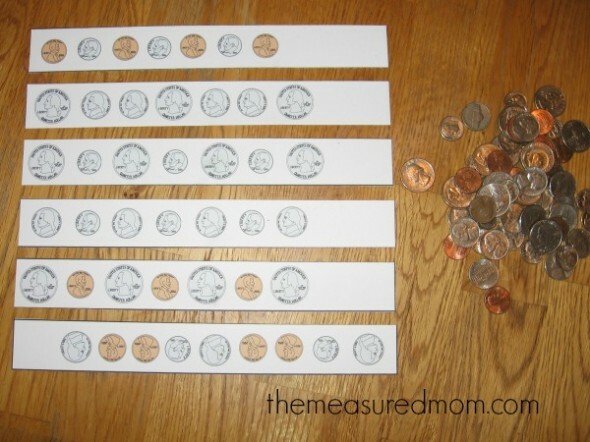 Print these coin pattern strips. 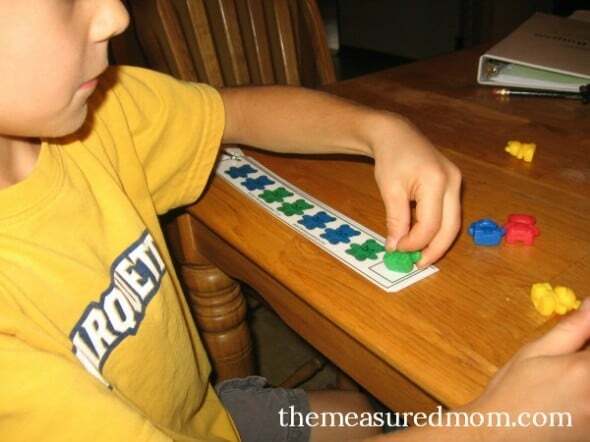 Follow The Measured Mom’s board Preschool Math on Pinterest. I’m a future teacher (Early Childhood Ed) living in the Bahamas and your website has been a blessing to me. So grateful for the resources. Thanks a mill! That’s so wonderful to hear, Shantell! Blessings on your education! i have been wondering how to go about teaching patterns, I can now find the easiest way ever! so straightforward. Thanks a zillion times.